Exclusively designed for discerning visitors, the space nestles discreetly among the lush paddy fields close to the legendary Echo Beach where the surf meets miles of soft sand. Just a short journey away from the rainforests beauty and magnificence of the islands volcanoes you will have unforgettable memories. 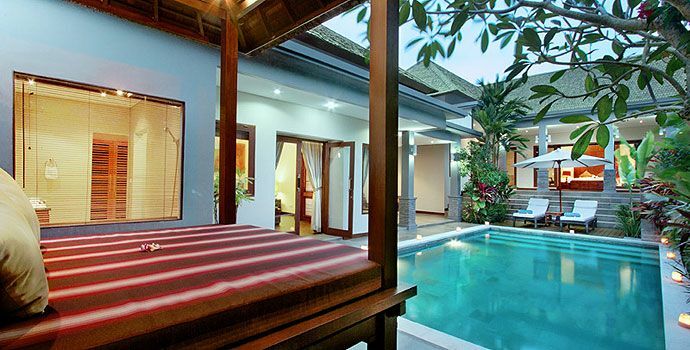 NOTE: ACTUALLY THIS VILLA IS A 2 BEDROOM PRIVATE POOL VILLA. THIS LISTING IS FOR BOOKING AND USE 1 BEDROOM ONLY, ACCOMMODATES/SLEEPS MAX. 2 GUESTS. Per room booking - Suites which are not booked WILL NOT be accessible or NOT BE book able to other guests/bookings. All other villa facilities, including swimming pool, kitchen, staff services, etc., will be fully available exclusively for per bedroom bookings. Located on the south-west coast of Bali and surrounded by rice fields, located in the exclusive car-free development of Canti Asri Villas, itself located in the charming village of Pererenan in Canggu. Set amongst stepped rice terraces and close to traditional Balinese temples, this villa has a restful and peaceful ambience. We offer our guests a relaxed and peaceful living environment that is within easy reach of all Bali has to offer. Situated in the exclusive car-free development of Canti Asri (Pererenan), protected within its own private compound, and is accessed by a private entrance, leading into landscaped gardens. It is a fully staffed two bedroom villa with spacious accommodation for up to four adults. All bedrooms are air conditioned with patio doors to allow easy access and cool breezes. The second bedroom is located next to the covered terrace and is fully air-conditioned with wooden floors and a luxury king size bed. The en-suite bathroom has a separate shower with a rain showerhead. The kitchen is well-equipped with marble countertops, a four-burner gas hob, electric oven, water dispenser, a large refrigerator/freezer, toaster, white chinaware, glasses, cutlery and a range of kitchen utensils. - First day ONLY Continental breakfast; following days in villa breakfast at grocery cost. - Welcome Drink and Refreshment. Our Villa Manager, Mr. Made can arrange spa treatments, manicures, pedicures and massages in the comfort of the villa at very reasonable rates. There is also a great little spa for manicures and pedicures in Echo Beach, 1 km away. Smoking allowed outdoor, e.g. pool / garden area. Canti Asri Villas, Villa #5 at Pererenan Village (Canggu).